The Weber Spirit E-320 is a perfect mid-range liquid-propane gas grill that can cook your food to perfection. The grill has been built with durable materials and the features can add smoky flavor to your food. The grill has received a design overhaul and it is now attractive then ever. The heat output is even and high, meaning that your food would be cooked with consistency. Remember, this is a basic grill and comes equipped with the basic features. You can easily cook food for a large family or group on this grill. Constructed with stainless steel, though lower grade, the Weber Spirit E-320 is the most durable grill available in this range on the market today. Stainless steel has been used in the overall grill architecture, including the burners and the cooking and working surfaces. The grill comes loaded with three burners that give out a total of 32,000 BTU per hour. The goods news is that this model is also fitted with a side burner, which has the capacity to put out 12,000 BTU per hour. The primary cooking surface of the Weber Spirit E-320 measures 424 inches while the user-friendly design makes it easy to carry out indirect grilling. You can cook different food at the same time by utilizing all the burners, including the side burner. The porcelain-enameled cast iron grates would make cooking more fun and easy for you. 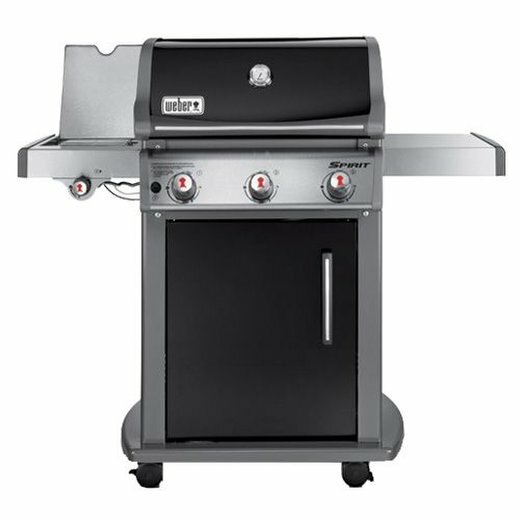 The grill’s construction makes it one of the most reliable products available on the market. The grill’s overall size is 63 by 52 by 32 inches. The electronic ignition system makes it easy for you to start the grill with the push of a button. Even though the burners give out enough heat, yet you have to be patient when it comes to the preheat time. Once heated, the grilling system can cook your food to perfection in no time. The grates have the tendency to retain and transfer heat evenly. This is a great grill to grill a burger or steak. When it comes to design, the Weber Spirit E-320 is perfect. The grill boasts fine finishing and immaculate touches. In fact, the company put almost three years work into designing its grills, and the efforts are clearly visible in its new model of grills. The Weber Spirit E-320 follows the Weber standardized grill design that has turned into a benchmark in the industry. The E-320 is way ahead of other grills in this range when it comes to performance, thanks to the construction, features and design. This grill will deliver a great performance to grill a burger, a steak or a chicken. The large space enables you to perform indirect cooking of a whole chicken or two. To sum it up, the Spirit E-320 is a sturdy, perfectly designed and highly functional grill you should have. You may think that some of the materials used in the grill are not of the highest quality, but when you look at the big picture, it would become clear that the E-320 would serve you for at least a decade without any major issues like rusting or corrosion. The good news is that you get this durable, well-designed and high performance grill at an affordable price. The Weber Spirit E-320 comes packed in a hard package. It is quite heavy, so you’d need the help of a second person to move the grill to the spot where you want to do grilling. Once at the location, just unpack the box and take out the grill’s different parts. You will also get a user instructions manual in the package, and all you have to do is read the manual thoroughly and follow the instructions to assemble the grill. Normally, it should take you 1-2 hours to set up the grill; however, if you face any difficulty, just call the Weber customer service and they’ll arrive to your help. Cooking on the Weber Spirit E-320 can be a pleasant experience. The grill comes loaded with all the basic features, so you can cook all your favorite foods on it. The burners give out a high BTU, and within 12 minutes, the grill would heat up to 500 degrees, which means that your food can be cooked really fast. Moreover, the heat output is highly proportional, so you don’t have to worry about burnouts or spots. You can even control the heat output and evenness from the front-mounted control panel. The grill’s design also makes it fun and easy to cook food. The Falvorizer bars can introduce a smoky flavor to your food like what you get on a charcoal grill. The cooking surface is large enough to cook food for a large group, meaning that if you have a large family or are fond of arranging parties, this is the grill you should have. Even better, the grill’s cooking surface and other areas are sooth enough to be cleaned easily. The primary heating area can accommodate 20 burgers at the same time. The grill comes fitted with a fuel gauge that would let you keep eye on the fuel status, saving you any potential inconvenience of fuel run out. You can cook vegetables and your other favorite dishes in the side burner. When it comes to storage, you get enough space underneath. Grilling burgers, chicken and vegetables can be really delightful with the E-320. Please also check out our weber spirit vs genesis grill comparison. This grill has been priced above the basic grills offered by other companies because it is more durable, reliable, finely-designed, loaded with all basic features and is very practical. You can buy it at a discount on Amazon with free shipping. Here are some of the best gas grills under 300 bucks if you are on a budget but still want a superb grill that serves you well.